I had one of those revelatory moments the other morning, where you step back and really look at something for the first time and notice it instead of strolling nonchalantly by. Just off of Piazza Vittoria, the square on the seaside at the east end of the Villa Comunale, is a street named via Calabritto; it runs for one block to Piazza dei Martiri. I looked up at it for a second and it hit me: this building isn't on the block —this building is the block. From the main road to Piazza dei Martiri, the building, named Villa Calabritto, occupies the entire east side of the street. It is three stories high, but these are three 18th-century stories, each one almost twice as high as a modern one. The entrance is framed by classically clean columns with a lovely arch over it; the entrance is at least 25-feet high and wide enough let a coach pulled by, say, a team of four horses turn easily in and through to the courtyard. I walked into the entrance and said something intelligent to a gentleman standing there. I think I said, "Gee, some building, huh?" He smiled and said, "Vanvitelli". If all you know about Luigi Vanvitelli (1700-73) is that there is, in Naples, a square and Metropolitana train station at that square named for him, that's not enough. It's good but not enough. Not that Vanvitelli wouldn't like the metro station. Like most of his buildings, the station is much larger and more magnificent than it needs to be. He might wonder at the electric lights, the train itself, and the escalators, but he might appreciate the grandeur. Vanvitelli was born in Naples, the son of the Dutch painter Gaspar van Wittel; thus, "Vanvitelli" is an Italianization. Vanvitelli studied in Rome and gained a reputation there before moving back to Naples: he designed the façade of the church of St John Lateran in 1732, worked on the consolidation of the dome of St Peter's in the Vatican, and helped decorate the Fontana di Trevi. In 1751 he moved to Naples to work for Charles III of Bourbon. Vanvitelli's best-known work is the Royal Palace at Caserta, the so-called "Versailles of Italy". He is also responsible for the Carolino Aqueduct that provided water to that palace and surrounding area. In the city of Naples, itself, he helped redesign the Royal Palace in 1753, the magnificent building that fronts on Piazza Plebiscito and sits on the site of an earlier Spanish vice-regal residence built by Domenico Fontana. 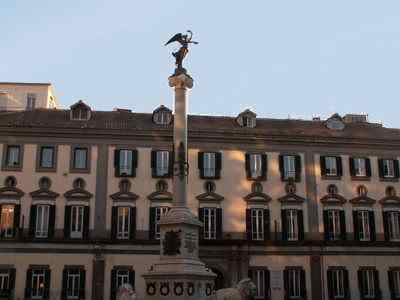 In the 1760s he redesigned the square now known as Piazza Dante and built the ornate semi-circular building, now a boarding school named for Victor Emmanuel II, that bounds that square on the east. Vanvitelli was so prolific in Naples and, indeed, throughout Italy, that Palazzo Calabritto is as neglected as an afterthought on most lists of his works. He set to work on it in 1756, essentially rebuilding an earlier structure on that site. The main entrance, mentioned above, is now on the small street leading from the Riviera di Chiaia and Piazza Vittoria to the prominent square of Piazza dei Martiri. If you walk the length of the block to that square and turn the corner, what used to be the servants entrance now sits on the main square (photo, right). The main entrance and secondary one have two separate street addresses, but the building is one, as you can see if you walk in either entrance to the courtyard and look at the entire building from the back, as it were. Nothing marks the building as a work by one of the greatest of all Italian architects, and though the façade seems to have been redone recently —or at least cleaned— Palazzo Calabritto shows signs of neglect. One of the main concerns for people interested in preserving this treasure is the subway train line construction going on along the seaside. Plans call for a tunnel, considerably below sea level, to go beneath the street named Riviera di Chiaia for the entire length of the park (the Villa Comunale) and then turn in and tunnel beneath (!) Palazzo Calabritto to a new station at Piazza dei Martiri.